Although remembered and even lauded in the public mind as the British prime minister during the Second World War who played a major role in Allied victory over the Axis Powers and Japan, Winston Churchill had a life and political career before 1939 conditioned by fighting other wars and, in peacetime, thinking about war. While historians debate his achievements and failures between 1939 and 1945, a less explored dimension is Churchill’s earlier connexion with war and warfare. 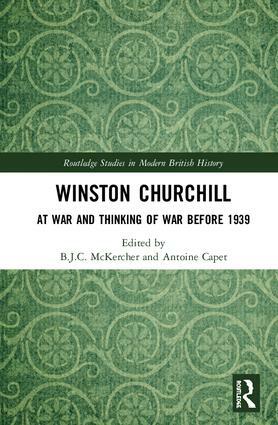 This book explores Churchill’s earlier experience in fighting wars as a soldier and politician. "Overall, these essays build up a picture of Churchill as a new breed of politician, confident in his own abilities, prepared to speak his mind, impatient to act and prepared to use his pen as a weapon. The book is likely to be of most interest to specialists or those with some prior knowledge of Churchill’s career, but I am glad that the conference papers will continue to stimulate debate. After all, in words attributed to Winston: "Meeting jaw to jaw is better than war."" B.J.C. McKercher is Professor of History at the University of Victoria, Canada. Antoine Capet is Professor of British Studies at the University of Rouen, France.